Interview with John Roberts on Bwrw Golwg about the Presidency and the criticism made of press and media. Had an initial discussion with Ynyr Roberts to see how the Council’s communication methods can be improved. Sent a press release appealing to Free Church members to sign the petition noting our responsibility, because of the tireless work of the free churches over the last two centuries, securing such an arrangement regarding collective worship in schools. Paul Gutteridge, Policy Officer of the British Free Churches Group, called to offer his help on communication issues. Put him and Ynyr in touch with each other. Sent e-mails to a significant number of individuals across Wales appealing on them to sign the petition started by a 13-year-old girl from Cardiff appealing to the Welsh Government to adhere to the current arrangements regarding collective worship in schools. Attended the Congregational Federation Annual Conference which was held this year in Swansea. Impressed that a denomination with a relatively small number of churches can easily fill in the Brangwyn Hall. It is a shame that the same enthusiasm is not shown by the Welsh churches! The presentations were fluent and the discussions were enthusiastic and of a very high standard. The highlight was the Induction of the Rev. Martin Spain as President for the forthcoming year – he, of course, a former President of our Council. Sent a message of sympathy to the Cardiff Muslim community following the Finsbury Park disaster. Attended the Launch of ‘Diaspora churches in Wales and their contribution to Welsh society’. It was an eye opener to see that so many Christian groups from different countries of the world from outside Europe exist in South Wales. The exhibition was remarkable to show and interpret the diversity of their worship and activities within their communities. Interview with John Roberts on Bwrw Golwg about the the July 3-5 Attended the General Assembly of the Presbyterian Church of Wales by invitation as President of FCCW. The issue of the two petitions was raised about collective worship in the schools. It was a pleasure to be able to inform members that nearly a thousand more votes had been cast in favour of collective worship than had voted against. I had an interview for Bwrw Golwg where the matter was further developed. Inter-Faith Council of Wales Meeting. A good cross section of representatives of the different religions and everyone contributing openly. An interesting presentation by two of the Park prison (female) chaplains – getting chaplains is a problem. There were a significant number of reports on meetings that Council representatives had attended. Sept 6 Sent a message to the Most Revd John Davies congratulating him on his elevation to the Archbishopric of the Church in Wales and expressing the hope for a happy working relationship in the future. Attended the National Police Memorial Day Service. It is held in the four countries of the UK in turn. This year it was held at the St David’s Hall which was full. It was a very moving service with a most timely address presented by the Rev Tom Evans (Chaplain to Dyfed Powys Police). The Archbishops and I took equal parts! Sept 28 Addressed a meeting of the North Wales Branch (Free Churches Council for Wales). The meeting at 1pm discussed the future of the Branch and then at 2.30 a meeting to present the Gee Medals to 33 long serving members of the Sunday Schools in the District. It was resolved to transfer the responsibilities for the Gee Medals to the Sunday Schools Council and to disband the Branch. Attended, by invitation of the Hindu Council for Wales, the Unveiling Ceremony of the Statue of Mohandas Karamchand Gandhi by the First Minister and the High Commissioner of India in Cardiff Bay. An address was also delivered by Ghandi’s great grandson Mr Satish Dhuplia who had travelled from South Africa for the event. I could not attend, the launch of “Reconciling Leaders Network”, at Lambeth Palace but we were represented by Rev. Richard Brunt who stated that the meeting was very valuable. One of the highlights was an interview with Justin Welby. He talked about his own experiences of reconciliation. They also saw a short video on international perspectives in the field. It was also a good opportunity to meet people from different churches. Attended an event in Y Senedd to “Cofio Pantycelyn”. (Remembering Wiiliam Williams, Pantyclyn). There were contributions from The Presiding Officer, The First Minister and Professor Wyn James. A new artwork by Ivor Davies -Y Per Ganiedydd- was exhibited and he himself explained the background to work. It will eventually be displayed at the National Library who hosted this event. The Wynne Melville Jones painting of Pantycelyn Farm was also displayed. Attended “A service of Commemoration of the 500th Anniversary of the beginning of the Protestant Reformation” at St David’s Metropolitan Cathedral, Cardiff. 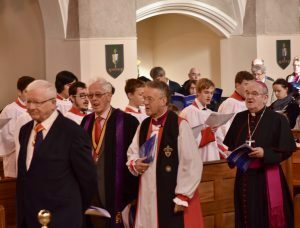 Participated in the Service alongside the two Archbishops. An excellent trilingual service. In the afternoon, Professor D Densil Morgan presented an impressive lecture on “The Catholicity of Protestantism: the inheritance of the Reformation of the twenty-first century”. Attended and presented a Welsh prayer at the Enthronement of the Most Reverend John Davies as Archbishop at Brecon Cathedral. Attended the 2017 Interfaith Dinner at City Hall, Cardiff arranged by the Muslim Council for Wales. There were two key note speakers: he Most Reverend John Davies (Archbishop) and Dr Mustafa Ceric (Grand Mufti Emeritus of Bosnia). With some 400 present all the introductions were in both Welsh and English and in that sense a marvellous example to some other religious and public bodies in our country. Attended the Annual General Meeting of the Wales Inter faith Council. Three very interesting presentations: Outline of the Wales Inter faith Conference to be held next May; Shaping the Cardiff Emergency plan; Show Racism the Red Card. Attended a meeting in the Assembly of the Cross Party Group on Faith. The topic was ‘Faith-Based Chaplaincy: Is it worth it? Very enlightening contributions by Chaplains working in hospitals, prisons and sport – proved the worth of such work and that it was irrelevant which faith or denomination you represented. Attended a meeting at the Mansion House, at the invitation of Councillor Huw Thomas, Leader of Cardiff City Council, to discuss with other Faith Leaders as to how the Council and the Faith Community can work together to meet the needs of a diverse city. A very interesting and fruitful meeting with Councillors, Chief Executive and ten of us representing a variety of faiths. As can be seen the early months of the year has been much quieter than the previous eight months. Nevertheless the experiences have been varied and extremely interesting and it is a privilege to fly the banner of the Free Churches Council of Wales. Attended the Bicentenary Celebration of the – Birth of Bahá’u’lláh – Founder of the Bahá’i faith at the Senedd. Interesting and educational presentations. . Also everyone was presented with a Welsh and English copy of The Hidden Words of Bahá’u’lláh which contain 82 meditational verses exploring the relationship between God and man. 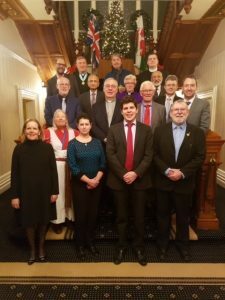 Attended the Meeting of the Wales Inter faith Council – various reports on meeting attended by representative but substantial time was devoted to agreeing on a Constitution for the Council.